The high voltage D. C. power supply shown in the schematic diagram finds its main application in amateur phone and CW transmitters and in laboratories where a variable source of D. C. voltage is frequently desired. This circuit does not require the usual primary variac or a voltage dropping resistor to obtain control of the output voltage. In amateur transmitters the variable voltage feature is advantageous for tuning up operations, where a low plate potential will aid in preventing damage to the RF tubes during initial adjustments. The variable voltage feature also allows the operator to conveniently reduce power for local contacts and thus comply with the FCC communications act, section 324. "In all circumstances, except in case of radio communications or signals relating to vessels in distress, all radio stations, including those owned and operated by the United States, shall use the minimum amount of power necessary to carry out the communication desired." Three high voltage D. C. Power supplies have been designed employing grid controlled rectifiers. One unit employs type FG-17 thyratrons and will deliver a maximum output of 1500 volts D. C. at .5 amps. The second power supply utilizes type 627 thyratrons and is capable of a maximum D. C. output voltage of 2500 volts at .5 amps. The third design employs R. C. A. type 2050 thyratrons and has a maximum output voltage of 400 volts D. C. at . 2 amps. The various circuit values and transformer types required for each individual supply are listed directly below the schematic diagram. 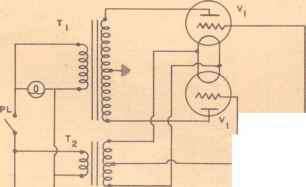 Inspection of the circuit diagram reveals that two thyratron rectifiers are employed in a conventional full wave rectifier circuit. This is followed by a two section filter and a bleeder resistor. The phase shift bridge transformer, T-22R50, and its associated circuit components are used to apply an A. C. bias voltage of constant amplitude, but of controllable phase, to the thyratron tube grids. The shifting of the phase of the grid voltage controls the point on the anode voltage wave at which tube conduction starts and thus controls the average value of the rectified anode voltage and hence the supply output voltage. The phase angle of the 0d voltage with respect to their anodes is controlled, in this circuit, by the resistance setting of the 50 K ohm rheostat. When employing a rheostat of this resistance the supply output.voltage can be adjusted to any desired value within the voltage ranges shown in Fig. 1. At the maximum output voltage condition, the control resistance is minimum and the phase angle between the grids and their anodes approaches zero. To produce lower output voltages, the phase on the grid voltage is made to progressively lag the anode voltage by increasing the resistance of the rheostat. When undertaking the construction of this type of power supply, several precautions should be observed. Adequately insulate the .25 mfd. condenser and all of the resistors from the chassis ground as they are connected in the high potential D. C. circuit. If the rheostat is to be controlled from the panel, an insulated shaft extension must be employed. The 50 K ohm resistors should be within 10% tolerance to prevent the load current from being unequally divided between the two rectifier tubes. 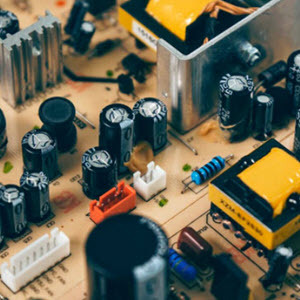 If full output voltage is not obtained when the rheostat is in the minimum resistance position, reverse the primary connections of T-22R50 to establish the correct phase relation between the anode and grid circuit. Transformer T-22R50 has a static shield between the primary and secondary to minimize the effects of line voltage disturbances on the rectifier grid circuit. However, it may be found advisable, which high RF fields exist, to connect a mica condenser of .001 mfd. from each grid to cathode. When using this supply, it will be found that as the output voltage is reduced, the amount of ripple voltage will increase due to the change in waveform of the rectified current pulses, which now flow over only a portion of the positive half cycles. When employing stock filter components, continuous voltage control from maximum down to zero cannot generally be obtained due to the higher values of input inductance required for continuous current flow as the tube firing is delayed. Instability may occur at one output voltage and current value somewhere below the minimum voltage ranges specified. The phase shift bridge transformer, T-22R50, can be employed with other types of thyratron tubes and circuit application where phase control is desired. The secondary insulation is rated at 5000 volts test and sufficient voltage amplitude is available to provide smooth, positive, phase control of the average rectified anode current. When using this transformer in other circuit applications, the R, C or L values assigned to the phase shift bridge arms should be such that the maximum secondary current rating of .03 amp. will not be exceeded.